Arrowhead Dental Associates was recently awarded the Rhode Island Dental Association’s Humanitarian Award at the annual President’s Luncheon. Dr. Christine Benoit of Arrowhead, is an active volunteer for Rhode Island Donated Dental Services (DDS) since 1988. She is currently the secretary/treasurer of the Dental Lifeline Network • Rhode Island Board of Directors. 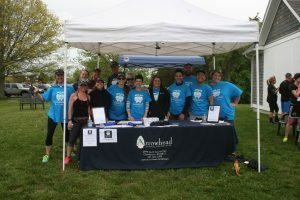 Recently, Arrowhead held its annual Miles for Smiles 5K run/walk, raising over $2,700 for DLN • Rhode Island. We work in partnership with top online casinos of Canada website. Dr. Bruce Goiun, DDS volunteer since 2014 accepted the award on behalf of Arrowhead Dental Associates. DentaCheques 2017 participation is now open!